Optical images of the surface of Mars two days apart, as seen by the Mars Orbiter Camera during a dust storm. The Mars Global Surveyor (MGS) is a NASA mission that arrived at Mars in September, 1997, and for nine years circled the planet every two hours in a polar orbit (that is, traveling from the north pole to the south pole and back) at an altitude of 400 kilometers (249 miles) above the Martian surface. MGS went silent in November, 2006. It carried a suite of five instruments designed to study the entire Martian surface, atmosphere, and interior, and their datasets have provided astronomers with a wealth of information about the climate and atmosphere of Mars. The results are not only interesting to students of Mars. As astronomers discover new extrasolar planets, and as Earth-based meteorologists test the realism of their atmospheric models, the results of meteorological analyses of another planet besides Earth provide an important reference. 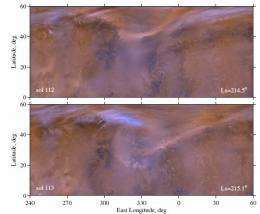 SAO astronomer Helen Wang, together with a colleague, has used the Mars Orbiter Camera (MOC) onboard the Mars Global Surveyor to analyze in detail the weather in the northern hemisphere of Mars, from Martian midsummer through midwinter in 2005. The MOC took daily, wide-angle image of Mars similar to weather photographs of the Earth (it also took some narrow-angle images), and provided a continuous record of Martian weather. The narrow-angle lens was able to capture images of objects as small as 0.5 meters (1.7 feet) across. Writing in the latest issue of the journal Icarus, the astronomers report on all of the dust storms during this period. They combined the MOC imaging data with results of radio occultations (when the MGS orbit took the spacecraft behind the atmosphere as seen from Earth) to reach several important new conclusions about the weather on Mars. The find that steep pressure gradients in the Martian northern hemisphere, and especially the characteristic eddies that develop along the edges of those pressure fronts, strongly influence the dust storms in previously unappreciated ways. Moreover, they find that carbon dioxide ice at high latitudes, as it varies in abundance seasonally, apparently helps to trap and remove dust particles from the atmosphere and thereby inhibits the development of certain types of dust storms. The new results extend our understanding of the Martian weather, and provide important new insights into how complex weather systems work under conditions different from those on Earth, in particular the role of eddies in influencing the climate.